Forklifts that operate using LPG, diesel or petrol emit carbon monoxide when running; electric forklifts don’t have any emissions. If you operate a forklift in an enclosed space without any ventilation, carbon monoxide levels can rise to the point where they are dangerous to your health. Carbon monoxide is a colourless, tasteless, odourless gas. It’s produced due to incomplete combustion and is often released in a stream of warm air from the engine which means it tends to rise, but not significantly and it does distribute itself fairly evenly throughout a space. Carbon monoxide (CO) is poisonous and dangerous. Because it can’t be easily detected, a person could experience significant exposure before they realise. At concentrations of just 0.3%, a person will experience headaches, dizziness nausea and loss of judgement in five to ten minutes and death within 30 minutes. The CO bonds to the haemoglobin in your blood, preventing it from carrying oxygen. Eventually, this deprives the brain and heart of oxygen. Taking a person out of an environment where they are experiencing acute CO poisoning doesn’t mean they will recover immediately; mental functioning could be affected for a while afterwards while the CO in the blood is replaced. How much carbon monoxide does a forklift produce? You should never use diesel or petrol-powered forklifts in enclosed spaces, but many companies do use LPG-powered forklifts. LPG forklifts burn a 60:40 mixture of propane and butane. 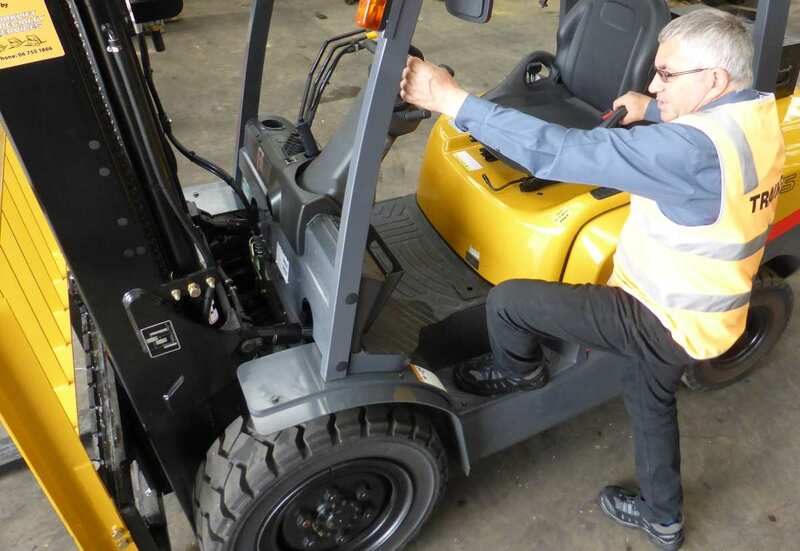 A new forklift produces around 0.5% carbon monoxide out of the exhaust. However, if the forklift is old and hasn’t been serviced, it can be as high as 5-10%. This can be more of a problem with older rental forklifts that have been driven hard. A well-maintained LPG forklift should emit no more than 1% CO. If your forklift has a catalytic converter it will release less carbon monoxide, but only once the engine is warmed up; catalytic converters aren’t that effective within the first 10 minutes of usage. When can carbon monoxide from a forklift become a problem? There must be sufficient ventilation to remove the exhaust fumes from the area. A New Zealand company was fined $26000 plus $7000 compensation (in addition to $10000 already paid) when a worker succumbed to CO poisoning when working in a chiller using an LPG-powered forklift. He was found unconscious on the floor after working less than an hour in the area. 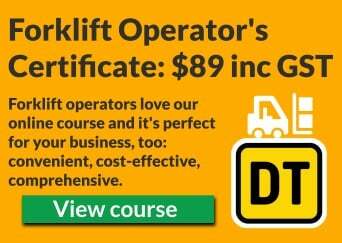 What can your forklift supplier tell you? Whether you are buying or renting a forklift, check what the CO output is and whether it’s suitable for your environment. How do you reduce the chance of carbon monoxide poisoning? Ideally, never use petrol- or diesel-powered forklifts in enclosed spaces. Ensure that spaces where LPG-powered forklifts are used are well-ventilated to at least the minimum level above. Turn the forklift off when not in use, i.e. don’t leave it idling. Service the forklift trucks regularly, using an exhaust gas CO analyser to limit CO emissions to a minimum. Replace fuel-powered forklifts with electric-powered forklifts, where practical. Know the symptoms of CO poisoning: dizziness, nausea and vomiting, tiredness and confusion, stomach pain, shortness of breath and difficulty breathing. Install CO monitors and alarms. Train your employees so they know how to recognise and report problems, and that they know the risks. If anyone is suspected as being affected by carbon monoxide they must go to the nearest doctor or hospital as soon as possible for a blood test. WorkSafe must be notified if CO poisoning has occurred. WorkSafe produces a guide to forklifts and carbon monoxide. If the person is unconscious, call 111; if the person’s heart has stopped beating, begin CPR.